BAT - BLOG : BATMAN TOYS and COLLECTIBLES: New BATMAN POP ART - Artwork Inspired by the DC Comics Universe! New BATMAN POP ART - Artwork Inspired by the DC Comics Universe! Here's a quick post to celebrate some fun creativity! First up is an Acrylic painting done by our friend, Marc Keller. 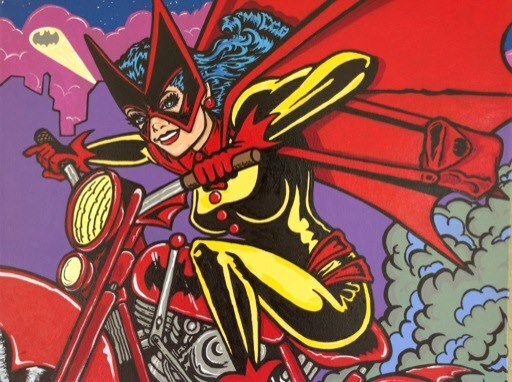 It's a great image of the original Golden-Age BATWOMAN, Kathy Kane! This is the older character who 1st appeared in Detective Comics #233 (July 1956). She is not to be confused with the more modern-day version, Kate Kane (2006 to present). Anyways, I totally love this artwork, it's an awesome graphic! Next up is a very cool Art Print created by our friend Steve Gaul. It's titled, "Pop Movement" (shown down below) and, of course, it features Batman and Robin in the best Batmobile Car from the Classic 1966 TV Series. Very cool! If you would like to see more work by Steve then please visit his site by clicking RIGHT HERE! A woman walked into a gallery where one of these was hanging. I introduced myself to her not knowing that she was part of the committee that hung all the pieces; when I told her my name her expression changed, as she shook my hand she looked me in the eye trying to remember which piece of mine she had hung and said, "You're Batman.". I gave it a beat and for the first time in my life I could honestly say,"Yes, I am Batman."! That was a good moment. Thanks Marc for sharing your painting, it's AWESOME and you seriously need to paint more, MORE! Also a special thanks to Steve for sharing his cool art print and fun story.